Have you ever decided against purchasing an item because the buttons are horrid? I have bought cheap garments (a £25 cashmere jumper from Primark comes to mind) and changed the tacky “faux” diamonds for dark grey ones. And sometimes a great jacket is ruined (for me) by having gold buttons when I don’t like wearing gold. So, for many dressmakers, the button choice is very important. As is the button-hole treatment. There are really three approaches to making holes in your clothes through which a button will pass, many times, as you get dressed and undressed, although the earliest button holes were just a slash in the fabric. The oldest type is the hand-stitched button hole, and this still exists today in tailor-made clothes. It is almost always shaped so that while one end is flat, the end where the button rests has a little round hole, with the stitching being curved. 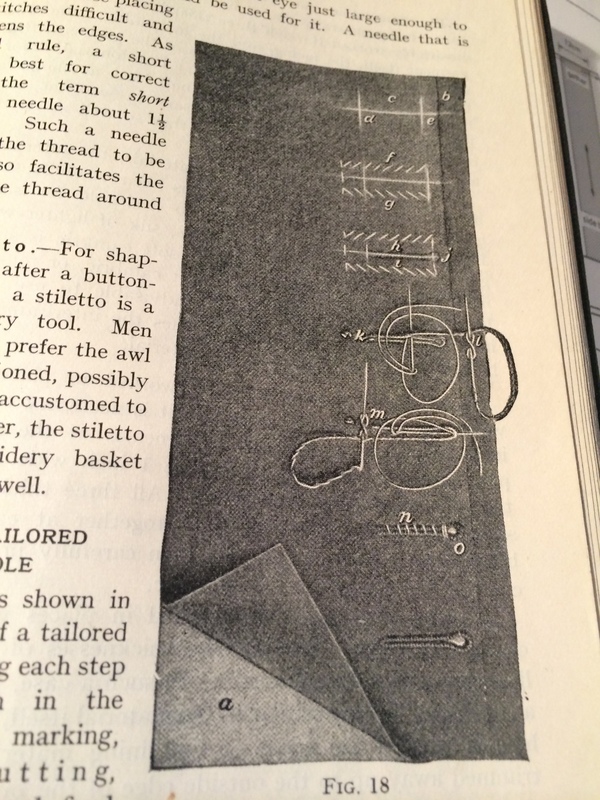 I have a set of books from the Women’s Institute in the 1940s and one of them Principles of Tailoring includes a good set of diagrams and a whole chapter on how to make button holes. It is really hard to make these well and it needs lots and lots of practice. They have their own special thread – button hole twist which is thicker and glossier than normal. Used with beeswax it is strong and fun to use. Buttonholes also have their own special “buttonhole” stitch, which is based on the blanket stitch but is really a type of embroidery. Some people make button holes by hand for a living and they become very expert at it. Their work is very even and beautiful. But a good tailor should be able to produce really nice button holes. (And there are industrial machines that make a reasonable copy of this style, so do not be deceived). Here is one of my handstitched button holes, on my Chanel-style jacket. I am not proud of it. I hadn’t done one since I was at school. I think they are very hard to get right. 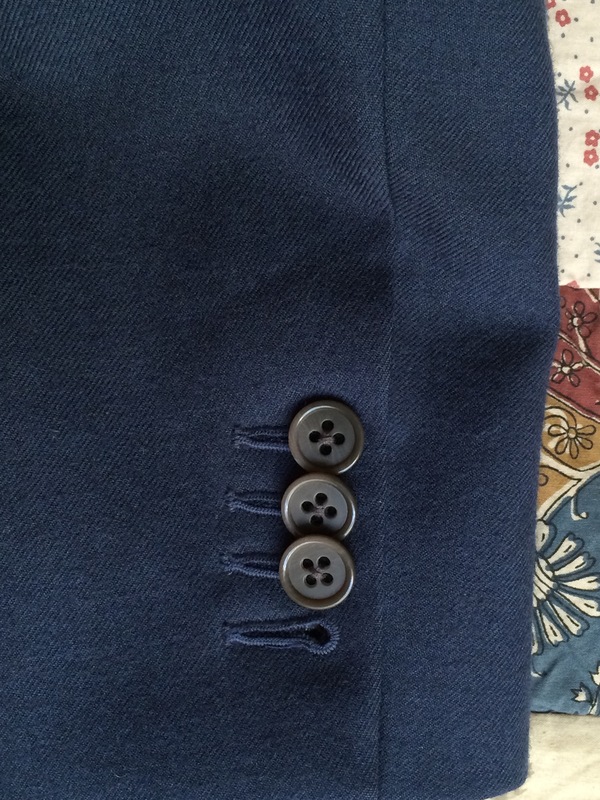 When making tailored garments I prefer to work a bound buttonhole. 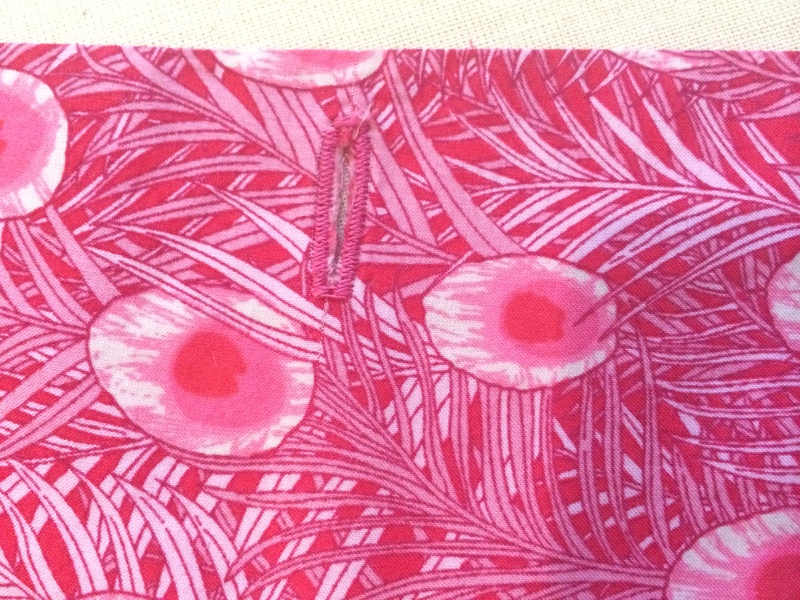 Most sewing machines with a zig-zag stitch will produce an acceptable button hole. The basic idea is that a zig zag stitch is used with a short stitch length to produce a satin stitch along the two edges of the button hole. 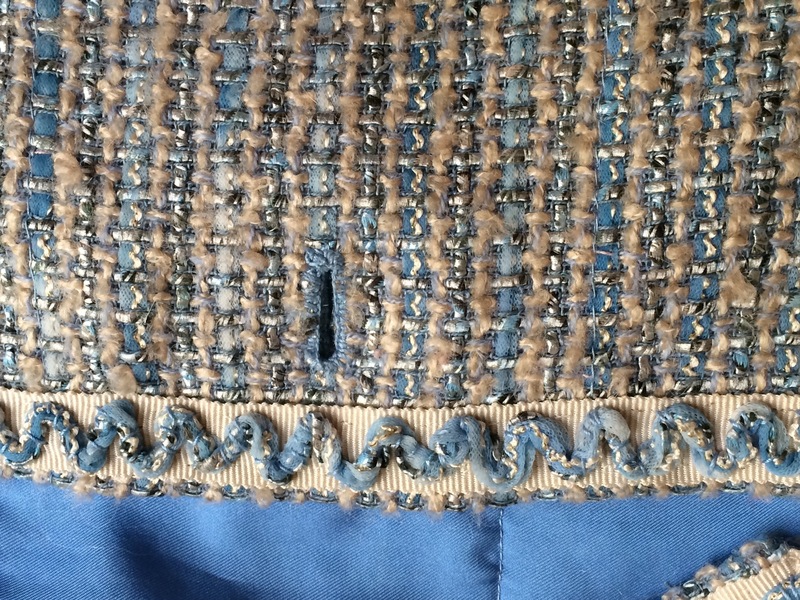 The top and bottom edges are finished with a stitch that is twice as wide so that it finishes both ends of the button hole. You can organise this yourself, which is how I learned but today even the cheapest machines have an automatic setting that does this for you. This gives more reliable results and saves you having to measure (and count stitches) quite so carefully. Here is a straight button hole on one of my blouses. My machine is semi-automatic and it annoys me that it always creates longer button holes than I want, so I have to trick it. The other main variation is a button hole, created on a domestic machine, that tries to mimic the hand-stitched, tailor-made button hole. I haven’t used this to date but might do on a tailored jacket if bound button holes were not suitable. I really like the look of a bound button hole, and I enjoy making them too. The long version involves making a “letter box” hole, finishing this carefully, creating separate lips, basting, and sewing them in by machine. But I have a cheat’s method that involves just pinching the patch into the “lips” and sewing it all down by hand. It is fast, very neat and hasn’t failed me yet. I daren’t describe how I do it here as it is not achieved in the regulation way. But here is a photograph of the finished buttonhole (and the back). Sometimes a design calls for rouleaux loops or similar as a design feature, say at the back of a wedding gown. Here three are used in a Diane Von Furstenberg pattern. These were made simply with a folded piece of cloth, stitched on the long end, turned, pressed, divided into three and inserted between garment and facing. A nice feature. Buttons are suitable for all. But here are a few rules. the scale of the garment matters too. Bigger buttons on outwear, tiny buttons on underwear, small on shirts, and medium on jackets. 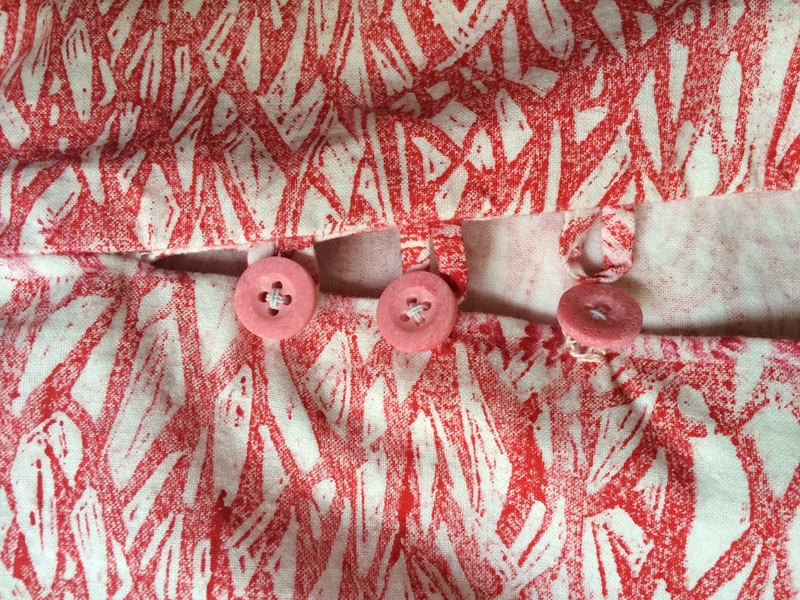 consider where you put buttons on a front fastening garment especially if you lengthen or shorten the pattern. A button at the waist is good for control but not if you wear a belt. A button at the collar should sit comfortably on the CF line. Make sure button placement prevents gaping. And be prepared to include additional (or fewer) buttons than the pattern specifies. An odd number is the norm, with even spacing, but you can have even numbers and uneven spacing (say to accommodate a belt). I agree, buttons can make or break a garment. My sewing machine makes passable button holes but I think if I were to make a jacket that had regular button holes, not bound, I would take it to a tailor and have them make the holes. I appreciate your insight on button sizes. Kate, you take so much care with your posts – thanks. I just put the vintage buttons on my dress with loops yesterday and I love them. In fact, I enjoy making buttonholes and believe it or not in my teenaged incarnation as a sloppy dressmaker I used to make them by hand (but badly). I recently read a tutorial for hand buttonholes on a blog and was thinking of trying them, but my next couple of projects use bound buttonholes so I shall try to master that technique first. In reading the instructions it seems simple enough but I guess we’ll see. I always take great care in selecting buttons for my knitted projects. In fact, it’s one of my favourite parts of the process. There’s an amazing old-style button shop/mercerie in Florence that is one of my favourite places to go while I’m there (ranks up there with the Uffizi!). I also troll etsy to look at the vintage buttons. I agree. The button can make or break the outfit, help to class it up or dress it down. Scale is very very important as you mentioned. Great post as always. I do like to use them as jewelry, as I don’t always like to wear a necklace, and I find scarfs hard to wear as they can often be too much material in my particular case. Thanks again Kate.